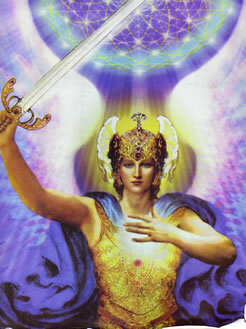 These words comes from Archangel Michael. Masters from East and West ... in any epoch had exclaimed that each one of us have a mission. You may suppose that this mission or job is when we are awake ... working in our daily journey, but the answer is very incomplete. The correct answer is that we never quit. Never. We have seven bodies, and inside these seven bodies we have four lower bodies. Now, in the same way most of us does not remember the past lifes and deny reincarnation, in the same way we don't remember our dreams or travels when we awake every morning. However, babies remember who they were and they also recognize and said who are they parents. Only cleaning the etheric body as well the seven bodies, EVERYDAY you can reconnect with your cosmic origins, that will enable you, to REMEMBER, your origins. Thus, the answer is: "We are angels". When we go to sleep we leave our physical body and using our Etheric, Mental and Astral bodies we travel the Universes and Mutl-Verses at speed Higher than the speed of Light. We can reach the Center of the Galaxy, at the speed of a blinking. Of course, the "standard Science" does not speak about that because is a Science separated from Religion, and neither Religion nor Science, solve and answer the Questions of man. At last like Angels ... we re-wear out physical suit made of blood and flesh to walk the world and fulfill our covenant. At sleep time we can visit the temples of the Will of God, or the Temple of Love, or the Temple of Resurrection, or the join Archangel Michael, and wear our helmet, spiritual Armour and hold our Swords (Sacred-Word) ... to navigate the Universes and help Archangel Michael and him legions the free the entrapped souls, or still going down the thirteen steps downstairs that lead to Hell, and rescue all the Souls in distress, binding the fallen angels and sent them to the Sacred Fire. In the name of the Lord, I had spoken today.